Then I decided I wanted a smaller version for my q-tips. I thought 3 patches across would work. Wrong. I forgot about the fact that the sides also form the ends. But it came out cute and it fits my eyedrops. I tried again with 4 patches across, and...success! I did leave the handles off the small ones but otherwise they are basically the same. Cute. These are adorable! I LOVE the colors. I've tried a similar tutorial before with mixed results, but might have to try this one. These are so cute and would be useful for so many different things! Like that fabric too. These look great. I have this tutorial saved too. Not sure when I'll ever get around to it. These are adorable. I think I may have this tutorial. One of many I saved. When will I get to them? 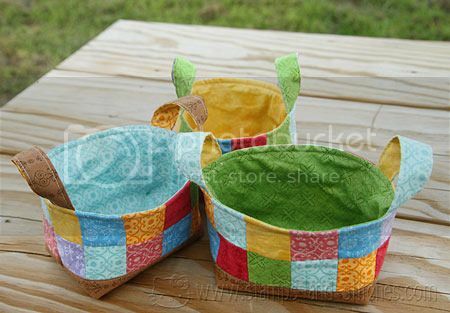 Oh you made so many cute baskets! 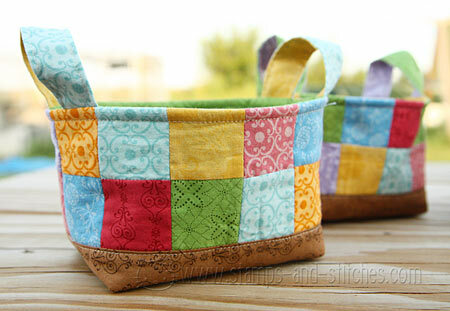 That is amazing how you were even able to find a great use for the small basket! The Q-tips fit so perfectly in the wide one! This are fabulous! I need another project to want to do....tee hee! These are so cute!! I would love to have a few of these around the house, they are so fabulous! how cool! I love them. Oh my goodness...these are just lovely. You did a fab job of sewing the! OMGosh...those are adorable!!! I should dust off my sewing machine! these are way cool, i'd love to learn how to make these!!! Oh, my goodness, I LOVE LOVE LOVE these!!!! So cute! OMGee! Gale these little baskets are adorable! They'd be great for paper crafting storage! ☺ So cute! These are all totally adorable!! Oh my goodness, these are cute, cute, cute. I had seen a similar pattern on pinterest (or maybe the same one) that I plan on making.....but who knows when that will be, lol. oh these are just adorable, probably a must make for Christmas gifts this year. Cute! Saw you on the Sew Many Ways link. I purchased that same fabric for the same reason! Fantastic! Pink Penguin is a great blog to go to for inspiration! I've made a couple similar baskets. So adorable! Added to my Make Someday List... thanks for sharing! Very cute. Great job. I have seen these, but I haven't tried one yet. After seeing yours, I'm inspired to get to it as soon as possible. These are fabulous Gale, and very practical. I love them all. Gale, I love your blog. So many interesting ideas here. These little baskets are adorable! I have lots of scraps and this looks like a great way to use them! Wow, are these unbelievably CUTE! Love these. You did such a terrific job on these! Gale, these are just awesome! Love your blog and all the quilts. I am simply amazed at your work!!! 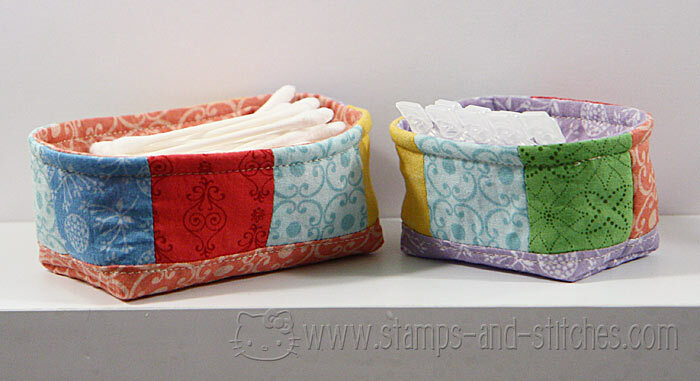 I love these little totes. They look fantastic and are sooo useful. Oh my gosh! They are super cool! Love 'em! These are so cute! I love the bright colors!